Fresh seasonal berries make wonderful desserts thanks to their natural sweetness and high fiber content. Fresh berries also contain high levels of cancer-fighting antioxidants and vitamin C. They're delicious enough to eat alone for a quick and easy after-dinner treat, but if you want something just a little more special, individual berry crisps are easy to whip up for a fun and festive summer dessert. 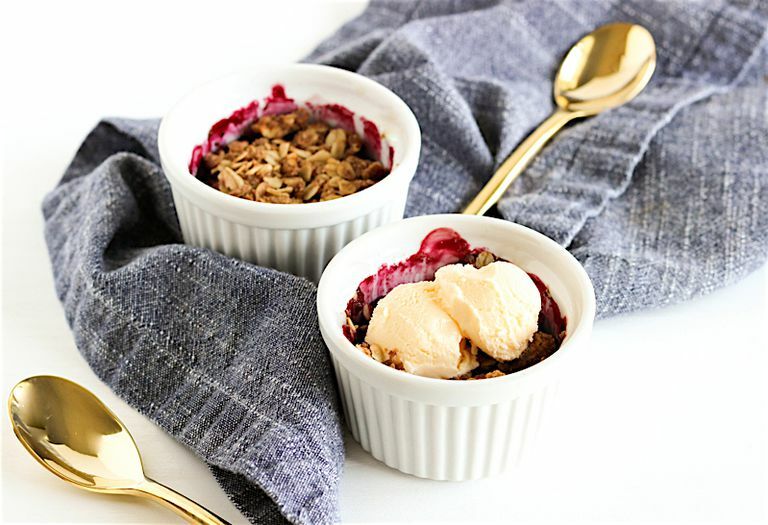 The berries get even sweeter when baked in the oven and taste delicious with the warm, nutty crumble topping. The great thing about these mini berry crisps is that they have built-in portion control. You can have a whole ramekin to yourself and can feel satisfied with a single portion. Top yours with a scoop of vanilla ice cream, a dollop of yogurt, or whipped cream! Heat oven to 350F. Spray ramekins with oil. Chop strawberries into 1/2-inch pieces. Mix berries in a small bowl. Divide berries between ramekins. In a bowl, mix together oats, flour, brown sugar, walnuts, cinnamon, and nutmeg. Pour butter over the mixture and mix to combine. Sprinkle evenly over the berries. Place ramekins on a baking sheet and bake 25 minutes, or until berries are bubbly and tops are golden. Remove from oven and let cool for at least 5 minutes before serving. Use one or multiple types of berries, or even add diced peaches or cherries. To make this dairy-free, use melted coconut oil in place of butter. Serve with a dollop of Greek yogurt, whipped cream, or ice cream.